Are you worried about your suspension and are looking for an auto mechanic for to check if you need an Audi shock replacement? Fluid MotorUnion in Naperville is the auto repair shop that has experience in replacing suspension components, as well as any service or repair work you may need. When it comes to common wear items, shocks and struts are not something most people think about. They’re not easily visible for drivers like tires, and they don’t wear out as quickly or are part of regular maintenance, like oil changes. Today we go over a recent Audi Shock Replacement where we identified and replaced a leaking shock. Keeping your car stable and not bouncing when you drive over rough roads are the big reason shocks and struts are so important. In the Chicagoland area, potholes and bumps are an everyday part of life. Almost every single time you get into your car to go somewhere, you can count on seeing and trying to avoid these road hazards. Every time you hit a bump or pothole, the tire’s reaction is to bounce upwards. The larger the bump, the more it will want bounce. 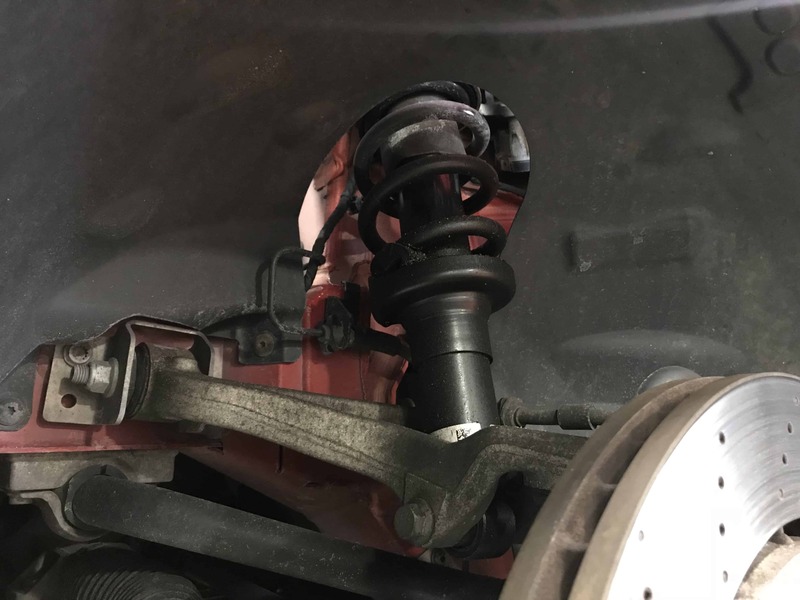 The main purpose of your shocks and struts is not to hold the vehicle up, but rather, it’s to keep bouncing to a safe minimum level. Now, think about the number of bumps and potholes you pass or even hit on your daily drive. Your shocks or struts job is to push down on the tire to maintain traction while dealing with road hazards in a safe and controlled manner. Shocks absorb the many bumps in the road, helping the car regain balance quickly after you hit a bump. Over time, even small road deviations will take their toll on the struts and shock absorbers. 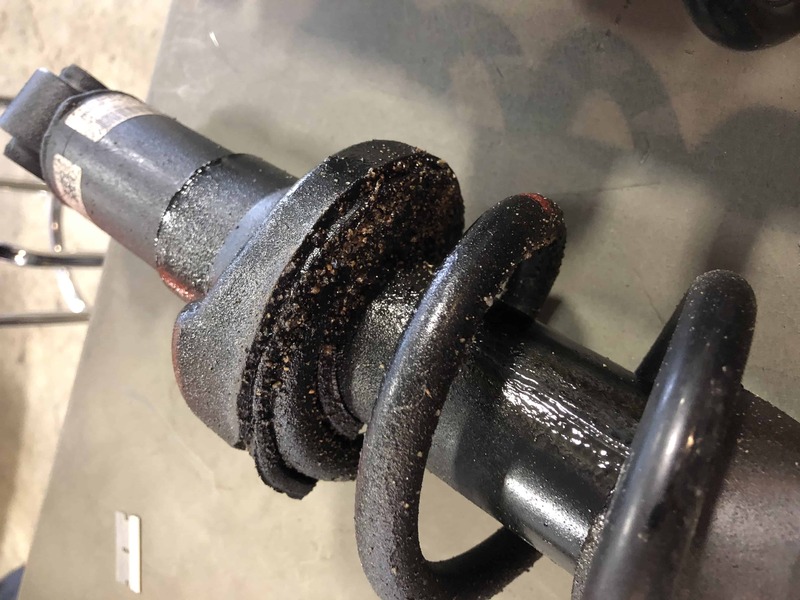 This is what wears out your shocks and struts, and this is why when an automotive technician recommends replacement, you should take that suggestion seriously. The V10 R8 is Audi’s rebadged Lamborghini Gallardo. 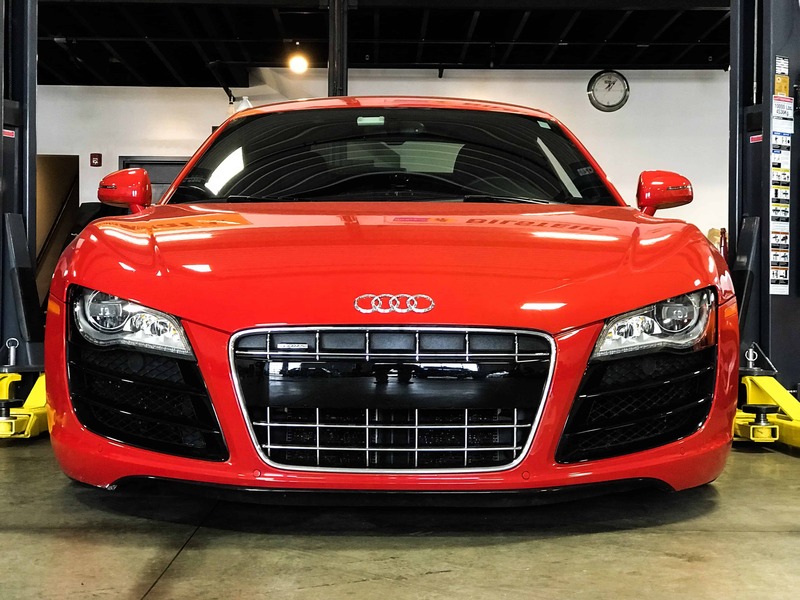 You may remember this red R8 from the last time we had it in for some cosmetic upgrades, as well as one of our Smooth merge stainless steel exhaust systems modified from our Lamborghini Gallardo system. The customer was complaining about a harsher than normal ride, so that left him worried. Our inspection confirmed his suspicions, leaking front shocks! To understand the seriousness of replacing shocks and struts, it’s important to understand what can happen if you’re driving around with a set that is worn out. After a bump the car will bounce for more than 1 “rebound” and will feel like it wants to continue to do so. The front end dives when you hit the brakes and the rear end squats when you accelerate. Bumps and potholes have a much “sharper” feel. The vehicle will roll more on corners. The weight of your vehicle’s body shifts and tosses your vehicle to the outside of the turn, making it harder to control. “Clunking” noise over bumps or with turning. This generally happens when the shocks/struts are failing or have broken. When we lift your car up and inspect the shocks and struts, we look for wear on the shock or strut, fluid leaks from the cylinder, or tears in the protective “boot”. The shock or strut cylinder bodies are filled with oil, so when they fail, they start to leak oil. Typically, they do not drip onto the ground, but instead, coat the entire assembly and will collect dirt and grime, as is the case with this customers V10 Audi R8. The boot is a piece that protects the shock from dirt, dust and road debris. When it tears or disintegrates, the dirt that gets in will make the shocks fail more quickly. We can test for bad shocks not performing the way they should is to do the bounce test. By “bouncing” on one corner of the car and then quickly releasing it, and the car keeps bouncing after the push, the shock is probably bad and the performance of the car will benefit from replacement. A shock or strut should be replaced once it is determined that it is leaking or damaged. Failure to do so will result in damage to tires, suspension and/or steering components and excessive brake wear, all of which will cause the performance of the vehicle to diminish rapidly. This is especially important because it could also lead you to get into an accident because of impaired handling and brake time. Most manufacturers recommend replacement every 50,000 miles. We at Fluid MotorUnion feel that this may be excessive. Many of the cars nowadays have suspension components built much longer and out of better materials. After 50,000 miles the suspension in your vehicle has gone quite a distance, and have definitely carried a lot of weight. So it’s worth considering a proactive replacement because chances are they are no longer performing as that should be, but an expert technician like the staff we employ will be able to tell you for sure. If you suspect there is a problem with the suspension on your vehicle and are looking to have it checked you, could do it yourself. But with all the knowledge that is needed to identify the problem and perform the proper repair, as well as the specialty tools that can keep you from serious injury or vehicle damage, leave it to the auto mechanics at Fluid MotorUnion who are experienced with suspension diagnostics and can perform your Audi shock replacement, or any other vehicle’s auto repair. We sell and install all suspension components for all makes and models. If you have questions on the shocks or struts of your vehicle, don’t hesitate to get in touch with us via phone at 630-305-3054, or contact us through email at blog@fluidmotorunion.com. We’re conveniently located at the Iron Gate Motor Plaza in Naperville, just minutes from the I88 Rt. 59 exit, right next to top golf!